Samantha and Tyler had a gorgeous summer day for their wedding at Aberdeen Chapel and The Market in Valparaiso. We also stopped by Taltree Arboretum for wedding party and couples photos. Our day started in Crown Point at Thomas William Salon with beverages courtesy of Coopers Hawk, laughter and friendship from the bridesmaids and loving advice from mom. Bridal prep at Thomas William Salon. Sammy got into her dress in the wonderful bridal suite at Aberdeen Manor just before her first look with Tyler in the garden. Bridal prep at the bridal suite at Aberdeen Manor in Valparaiso. Dad received a special tie courtesy of the bride while mom looked on. Bride with her parents on wedding day. Tyler is in the United States Navy and is stationed out in San Diego, CA right now. He and his guys celebrated with a pre-ceremony game of pool as second photographer Lauren captured the moments. Groomsmen prep for a summer wedding in Valparaiso, Indiana. Samantha and Tyler's first look was a wonderfully private moment in the garden of Aberdeen Manor. We placed the groom under a shaded trellis as Sammy walked toward him. First look for the bride and groom in the garden at Aberdeen Manor. Portraits of the bride and groom at their summer wedding in Valparaiso, IN. The summer ceremony inside of the picturesque Aberdeen Chapel had lots of laughs with Reverend Doug Klukken presiding. Sammy and Tyler exited into the bright midday sun and soon we were back inside for family photos. Wedding ceremony at the Wedding Chapel at Aberdeen Manor. Congregation attend a wedding ceremony at Aberdeen Chapel in Valparaiso. The bride and groom kiss as they exit the Chapel at Aberdeen Manor. Family and wedding party portraits inside the Aberdeen Chapel. We spent the late afternoon at Taltree Arboretum taking wedding party and couple's photos at the beautiful nature preserve. Bridesmaid and groomsmen group photos at Taltree Arboretum. The wedding party stars in a sequel of The Sopranos TV show. 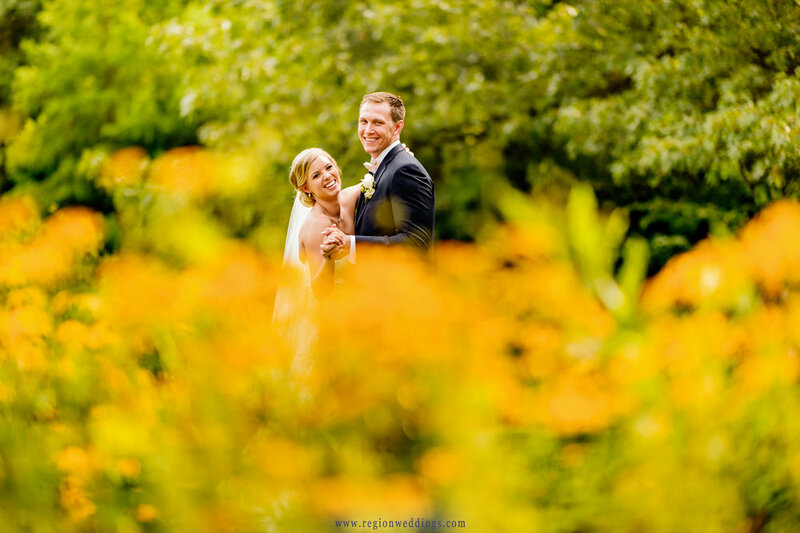 Taltree Arboretum is a great location for romantic wedding photos and we definitely used the gorgeous colors to our advantage. Bride and groom share in a kiss amidst the nature of Taltree Arboretum. Romantic couples photos at Taltree Arboretum in Valparaiso. Wedding days can be a real whirlwind, so if possible I like to have my couples take a break from pictures and just sit and talk for awhile. Of course, I am sneaking in some shots (as was the video crew at Whole Hearted Wedding Films) and these are often the most natural expressions. Bride and groom sit and chat on a bench surrounded by greenery at Taltree Arboretum. We had a few puffy clouds in the eastern sky so made sure we got Tyler and Sammy up on the rolling hills at Taltree Arboretum where two clouds were nice enough to hover on each side of the newlyweds. Thanks Mother Nature!! The bride and groom slow dance on the rolling hills of Taltree Arboretum nature preserve. 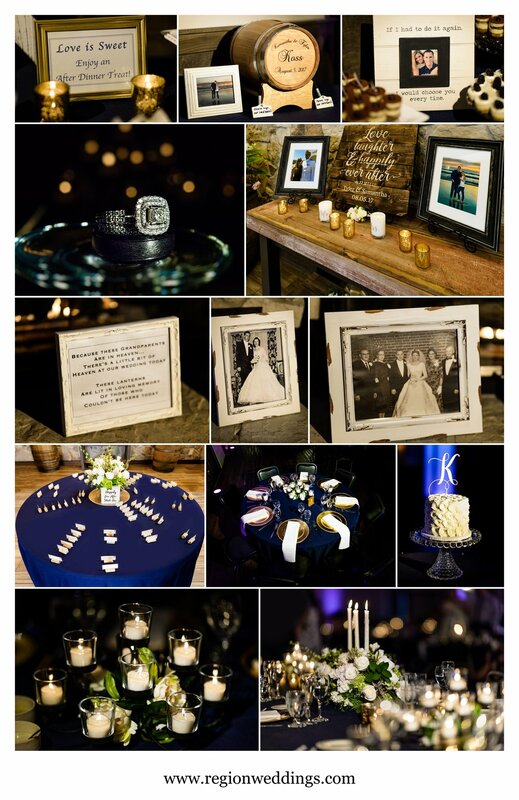 The Market in Valparaiso is a relatively new wedding venue and Samantha and Tyler had it decorated to the nines. The candles were beuatiful and the tribute to deceased grandparents (along with their wedding photos) was very touching. Wedding decorations at The Market in Valparaiso, Indiana. The introductions featured a "flower toss" and the speeches were funny and emotional all at once. Soon it was cake cutting time, dinner and on to first dances. Wedding reception at The Market in Valparaiso, Indiana. Parent dances and first dance at The Market. Party time at a wedding reception at The Market in Valparaiso, IN. First dance for the bride and groom at The Market. I hope you have enjoyed this sneak peek look at Sammy and Tyler's summer wedding at The Chapel at Aberdeen and The Market in Valparaiso, Indiana. As always, please fill out the Contact Form to inquire about your big day. More images to come on Instagram and other social media listed below. Enjoy! !